Since having her first child, Ellie Stoneley, 51, has juggled her new motherly duties with becoming a first time author. “I’ve always written, whether for work, myself or latterly my blog, but when my daughter was born I felt I had so much more to say. To date I’ve written about my personal experience of pregnancy, through the baby years and of breastfeeding my daughter. I’ve also written news pieces for Huffington Post and the local paper in Cambridge, plus various parenting websites and been invited to appear on various BBC TV and radio broadcasts. Ellie’s book is widely available online, or direct from her publisher, Pinter and Martin. If you’re local to Burnham Market, you can also buy it from Heirloom Toys. Spare time is somewhat of a luxury for Ellie, so relaxing on spacious beaches is a favourite way to spend her weekends. From her home in Cambridge, she regularly visits North Norfolk’s wide array of coastal villages, and Brancaster is one of her favourite areas. “The coastal areas of Blakeney, Wells and down to Hunstanton are all gorgeous, but I particularly adore Brancaster beach. I’ve lived in California and Australia, been on beaches as far flung as Thailand, Mauritius and Costa Rica, but there’s no beach in the world that compares to Brancaster. It really is magical. While at the beach, Ellie likes to do as little as possible and really relax. “There’s so much to do, but I mainly like to leisurely walk around and paddle. Walk one way to find a glorious inlet where it’s sometimes possible to sit and watch the seals on the opposite bank. Go the other way and you can find beautiful rock pools and pebbly outcrop. I love searching for razor shells and starfish there with my daughter or building sand castles together. “There’s a wreck to the right of the beach, which is totally exposed at low tide and totally covered at high tide. 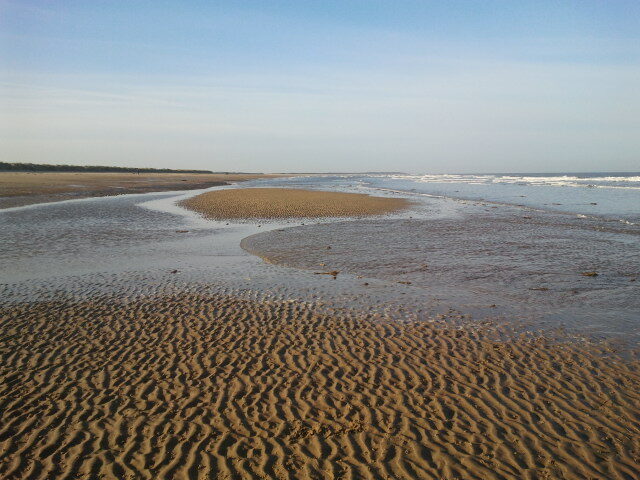 I think it somehow gives a context to the beach and you’d never imagine it was there at all during high tide. Beware though, many people have become cut off by the tide when trying to visit it up close, so you can only really enjoy it from a distance. “It’s really calming to just sit and enjoy the views too. The sky is always changing: bright life-affirming blue with wispy clouds one minute, to storms that feel like they’ll sweep you up the next. It’s never the same and makes you feel at one with the world. Going down to the shore at night is very romantic and you’ll be rewarded with an incredible view of the stars. The civil parish of Brancaster is actually made up of neighbouring villages Brancaster, Brancaster Staithe and Burnham Deepdale. A designated Area of Outstanding Natural Beauty (AONB), you can explore it and the surrounding area via the North Norfolk coastal path. Brancaster Staithe was once a thriving port for cargo and grain-carrying ships, and although this has diminished over the years, many locals still make a living from the fishing industry. The harbour makes for a charming sight, with brand new sailing dinghies alongside retired buoys and lobster nets. “You can take part in various sailing activities at the harbour, either at the sailing club or boat chandlery. A sailing school also offers courses and training,” Ellie says. “I did some sailing myself there, years ago, which was great fun. The National Trust run plenty of free family events in the area, especially during school holidays, as it’s part of their Brancaster Estate. 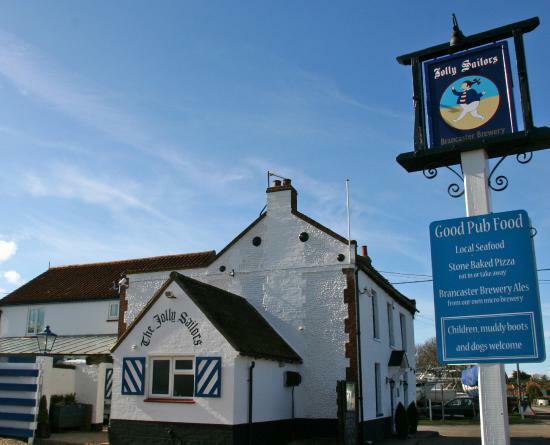 Ellie is very fond of Brancaster and the surrounding villages, and there’s plenty to do for all ages and interests. “Brancaster is a very peaceful little village that winds along the high street, with narrow lanes and lovely flint cottages. If you like historical sights then visit St Mary the Virgin’s church or the Branodunum Roman fort ruins, or take a look at the art exhibitions in the village hall from local artists and sculptures. There are a couple of interesting vintage shops to potter about in and tourist shops where you can pick up some Brancaster souvenirs, a bird watching book or a razor shell from the beach. Ellie has also sampled the food in many of the eateries in the area. There is a large car park about 100 yards from the beach which has pay and display charges. Toilets are also available next to the beach shop.